Throw out your old ideas about C and get to know a programming language that’s substantially outgrown its origins. 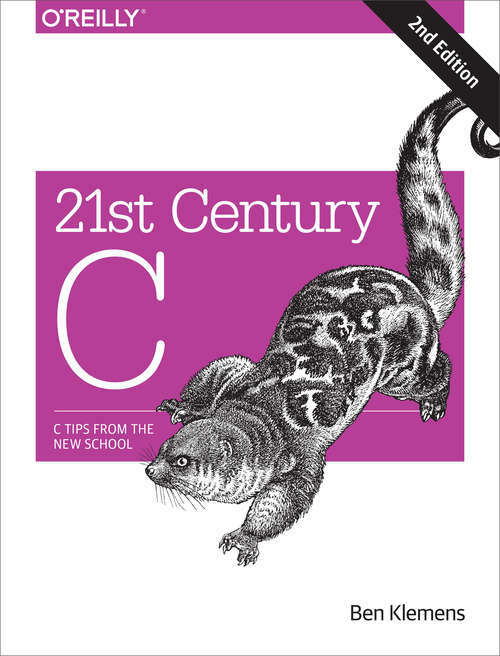 With this revised edition of 21st Century C, you’ll discover up-to-date techniques missing from other C tutorials, whether you’re new to the language or just getting reacquainted.C isn’t just the foundation of modern programming languages; it is a modern language, ideal for writing efficient, state-of-the-art applications. Get past idioms that made sense on mainframes and learn the tools you need to work with this evolved and aggressively simple language. No matter what programming language you currently favor, you’ll quickly see that 21st century C rocks.Set up a C programming environment with shell facilities, makefiles, text editors, debuggers, and memory checkersUse Autotools, C’s de facto cross-platform package managerLearn about the problematic C concepts too useful to discardSolve C’s string-building problems with C-standard functionsUse modern syntactic features for functions that take structured inputsBuild high-level, object-based libraries and programsPerform advanced math, talk to internet servers, and run databases with existing C librariesThis edition also includes new material on concurrent threads, virtual tables, C99 numeric types, and other features.